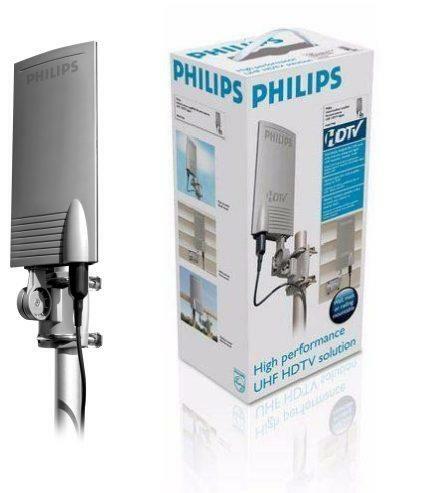 Philips SDV2940 antenna is scientifically designed to improve analog and digital UHF reception. The compact design of the antenna is very versatile and can be used both outdoors and indoors and can be mounted to walls, railings or any sturdy base. The 18dB amplification boosts weak signals, expanding your reception range and allowing you to receive more signals over a greater distance – ideal for those who live in urban or suburban areas. The surface of the antenna is weatherproof and paintable allowing you to customize the appearance of the aerial to match your indoor or outdoor décor. Antenna comes with mounting kit and 20 feet of coaxial cable. Receive TV digital, analogical (UHF) and digital radio With this antenna of 18 amplified dB This antenna offers an excellent digital reception. It is compact and easy of installing. Appropriate for installation in the interior and in the exterior. Now with the digital TV being transmitted in UHF you need an antenna of excellent quality for to receive that sign and to enjoy of the best of the digital TV. The objective of that article is to speak of the qualities of that antenna that it counts with an amplification of 18dB for every band of UHF (channel 13 to the 68) and perfect for receiving the sign of the digital TV. she is adapted like this for distant places of the transmission towers where the sign is weak. It is important to stress that she has been offered in the internet as antenna for UHF, not being adapted to receive signs of the strip of VHF of TV and commercial FM. That antenna presents good rigidity to be placed in the external part of the house. If you don’t have digital sign it can use that antenna to receive the sign of analogical TV in UHF and to discover new possibilities of channels to attend, since that antenna is amplified (18dB) making possible to receive the sign of TV analogical UHF to in more distant areas of the towers transmission. The amplification of 18 dB increases the weak signs, expanding your reception range and allowing to receive him/her more signs at a larger distance. This design extremely compact improvement the reception analogical UHF the digital. It also receives digital radio DAB Banda III. The resistant surface to meteorological conditions and allows to personalize him/her the appearance of the antenna so that it corresponds to your decoration interior or external. It seems this antenna is, as all this kind of consumer products, wide band antenna. It could receive and be jammed by transmitters from 40 to 1000 MHz. If you’re an amateur radio close to this antennas’user, you ‘ll have problems with neighbourhood !